Burrowing four o'clock, photographed at Gulfstream Park beach. Gulfstream, Palm Beach County, in September 2013. Burrowing four o'clock, Okenia hypogaea, is not a plant you would expect to be studied for its commercial potential, mainly because it is so rare. But in 2002, a group of scientists took a look at this plant for use in the food and cosmetic industries. So what might burrowing four o'clock offer the world? Besides its beautiful, little flowers? In a word, starch. High quality starch. More on that later. Right now, the botanical basics. 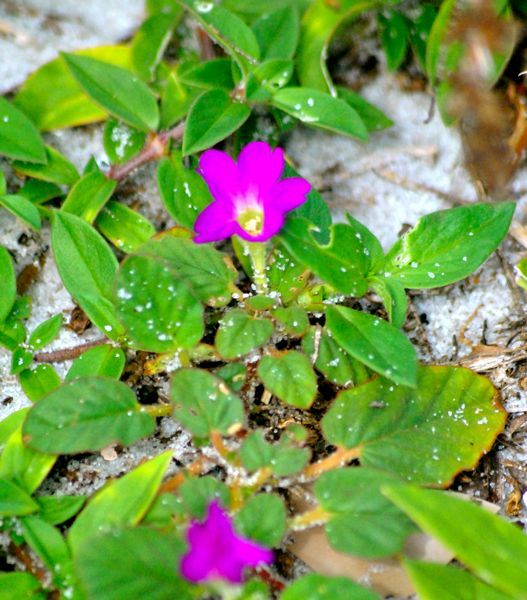 Burrowing four o'clock is a ground hugger, a vine that makes its home on coastal ridges. 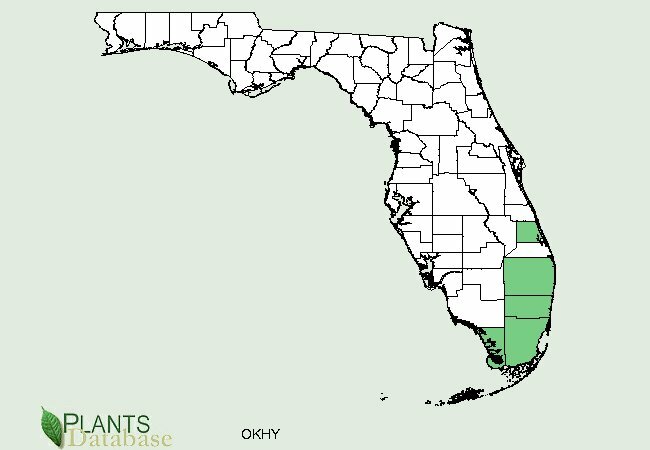 In the United States, it's found only in Florida, and only in St. Lucie, Palm Beach, Broward, Miami-Dade and Monroe counties. There are populations growing on both Mexican coasts, but no one knows how extensive they are. In Florida, burrowing four o'clock is legally protected by the state as an endangered species. It is not federally protected. Burrowing four o'clock is part of a family of plants that only flowers late in the day, hence the second part of its common name. When the flowers are fertilized, they bend toward the ground and produce a brown, peanut-like fruit that is pushed underground, where it matures and produces seeds, hence the first part of its name. By burrowing, the seed is protected from being washed away by the tides. The plant mostly flowers early spring to late fall, but the blossoms can appear year round. Summer is the peak season. The flowers are mostly rose-red to purple, rarely yellow. Leaves are arranged oppositely on the stem and are covered with small hairs. It is an annual and can be ephemeral, meaning it can come and go at a particular site from season to season. At maximum, it's no more than six inches tall, but it will form large, open patches. Its roots help keep dunes from eroding. 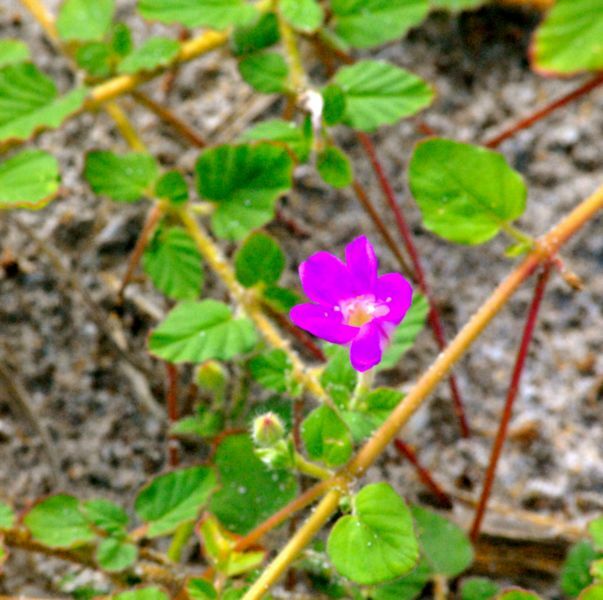 Globally, the plant is considered vulnerable to extinction because of its low numbers in Florida and unknown status in Mexico. Main threats are coastal development and foot traffic. The one bit of good news is that the plant is cultivated and available from a few commercial nurseries. Which brings us back to starch. The seeds of burrowing four o'clock are high in starch, so much so that scientists have explored its suitability for use in foods and cosmetics. According to the journal, Starch, burrowing four o'clock can retain more liquid than corn starch, at least at certain temperatures, and making it potentially useful. But we're guessing that corn starch is a little easier to come by than that of a plant on the endangered species list. While it is most commonly found along east coast beaches, usually along the line where vegetation starts to grow, it can grow somewhat inland as well. 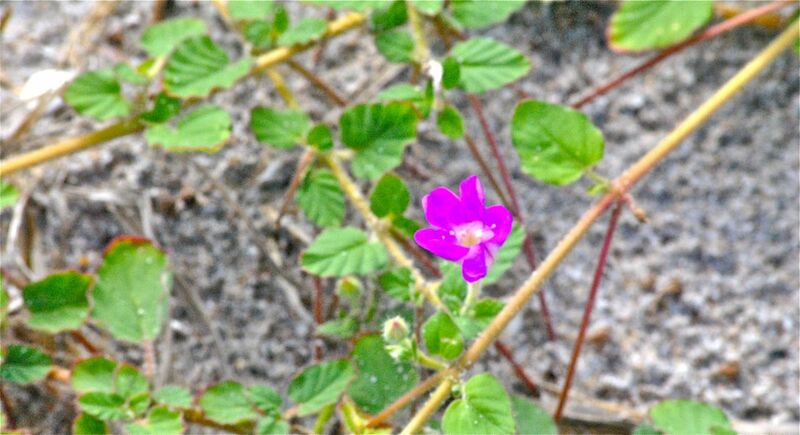 We've seen it at Seacrest Natural Area in Boynton Beach, an ancient dune. Burrowing four o'clock is a member of Nyctaginaceae — the four o'clock family — which includes bougainvillea and wineflower. Other names: beach peanut and dune groundnut. 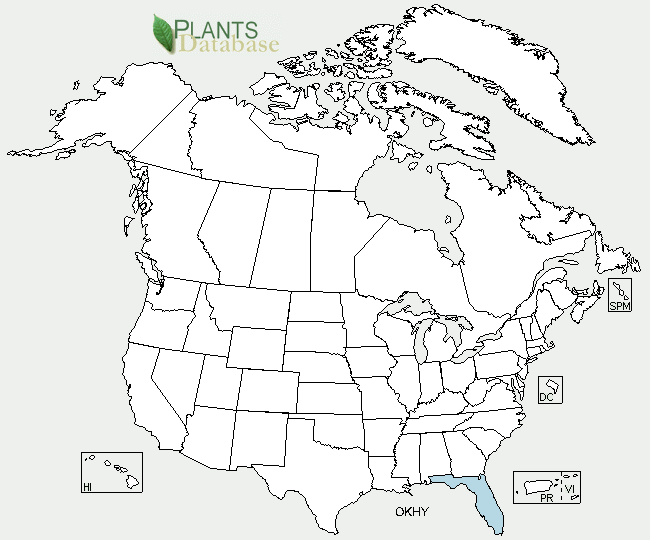 United States Department of Agriculture (USDA) distribution maps for burrowing four o'clock.